I got to interview Bernadeth for my blog about her journey as a blogger and about her personal sense of fashion. Hope you enjoy reading. Sidney: When did you interest in fashion begin? When did you seriously think about blogging about it? Bernadeth: I’ve always been interested in fashion ever since I was a little girl but it grew even stronger when I started traveling a lot and got the chance to see awesome clothes and stylish people from other countries. Sidney: How was your blogging journey been so far? How do you deal with the ups and downs of blogging? Bernadeth: My idea of blogging started when people would compliment my outfit and so, I had an idea – why not share it to other people? And then I did. I created a blog just a few weeks when I arrived from Canada and at that time, I knew I had to share the outfits that I wore from my trip and luckily, a lot of people liked it and I continued updating my blog. I guess in everything that you do there will always be ups and downs, I have been blogging for almost two years now but I got so active just a few months ago. You just have to be positive and choose the people who you can trust. Sidney: How would you describe your overall sense of style? 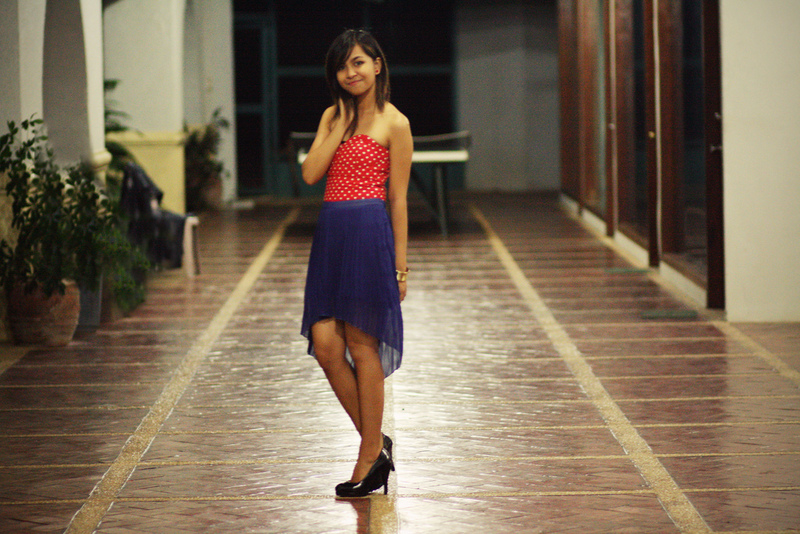 Bernadeth: I guess it would be a mix of something girly but with a little twist of being edgy. I would always wear dresses or skirts but sometimes, I just can’t help myself to wear spikey accessories, cuffs etc. Sidney: What are your favorite fashion blogs and magazines that you follow? Bernadeth: My favorite blogs are The Golden Diamonds, Kayture, Its Camille Co and Fashiononymous, every time I go online I just have to visit them to see their newest post and they are also my inspiration when it comes to blogging. For magazines, I love Teen Vogue and our local magazine here in the Philippines, Candy. Sidney: I assume you read about fashion from all over the world. How do you think fashion in Philippines is different than say United States, if at all? Bernadeth: Here in my country, we only have summer — all year round, it’s very hot and we only got the chance to wear sweaters if it’s a rainy day or Christmas so, I guess fashion in my country is very different since we only have a closet filled with summer-y clothes. And also, in other countries they wouldn’t care about what you are wearing but here in the Philippines, when I wore the outfits that you can see in my blog, everyone would stare at me from head to toe, sometimes they would say nice things or sometimes they would ask “why is she wearing boots?” haha! The funny thing is, wearing boots here in my country is not common. Sidney: What are the places you would like to travel to personally, just for absorbing their fashion sense? Bernadeth: Of course, the fashion capitals of the world … Paris, Tokyo, Miami and New York! Each of them portrays a different theme when it comes to fashion and I would love to take a risk when it comes to my outfit if I got the chance to visit one of them. Sidney: Do you have any personal favorites in terms of brands? Where do you usually shop at for your clothes? Bernadeth: I am not really a person who likes branded stuff. If I like the style or design of something no matter what brand it is then I would buy it. My clothes are usually from Primark since my grandmother loves to buy clothes for me, thrift shops and H&M. Sidney: When you started blogging in 2010, did you think your blog would be as popular as it is today? Are you happy with the progress you’ve made as a blogger? Bernadeth: I have no idea that my blog would be gathering so many views and followers! Of course, I am. I feel really blessed with what’s happening on my blog ever since I became very active just a few months ago and couldn’t have been happier hearing compliments from my readers, family and friends. Sidney: Where do you get the inspiration for your blog and your personal outfits? Bernadeth: I get inspiration from magazines, other fashion blogs and music. Sidney: Do you have any favorite colors when it comes to your outfits? Any favorite outfits in general? 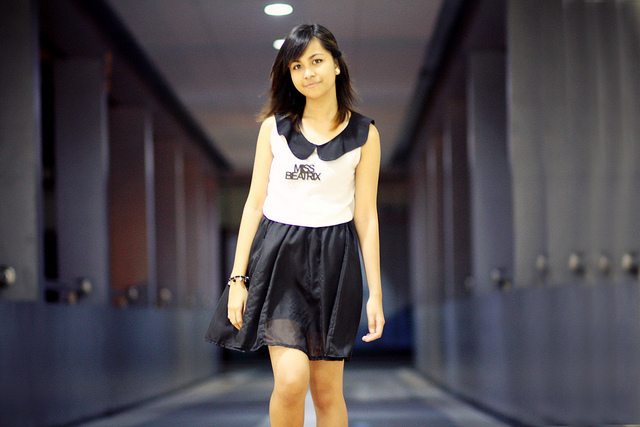 Bernadeth: I love the color black in my outfits because you can mix and match it with other colors and accessories. Right now, I would say this outfit is my favorite because it completely represents my style. Sidney: Who is the photographer for your pictures? Sidney: If you could change one thing about your blog, what would it be? Bernadeth: I guess it would be my posts last 2010 and 2011 – I did not update my blog frequently in those years unlike today, so I would really love to add more posts and be active during that time. Sidney: How do you promote your blog? Bernadeth: Social networking sites are very helpful in promoting my blog. I always link my newest posts in my Facebook, Twitter and Tumblr account. I also visit and comment random blogs to gather more views and followers. Zara is today a household name for being one of the best “fast fashion” companies that provides affordable fashion to the masses. It is part of the broader Inditex’s brands — Zara, Zara Home, Bershka, Massimo Dutti, Oysho, Stradivarius, Pull & Bear and Uterqüe and they all follow the same model of making fashionable clothes and accessories following the latest trends that are well made and far cheaper than most other expensive brands. 1. Fast fashion like Zara is picked up by demand and consumer comments. If a lot of people comment to the store attendants that they like red pants, this is sent to the headquarters. If the same input is coming from stores across the country/world, it is a trend and Zara is going to act on it. 2. Celebrities like Kate Middleton have been photographed wearing Zara. It no longer seems to attract a snobbish look that Zara is just imitation. They indeed have mastered the process innovation rather than product innovation. They are able to identify trends quick and act fast on it to make money and sales. 3. Fashion trends are global according to Zara. This is good news for this company because they can mass produce the latest trend for all cities. They say fashion in New York to London, San Paulo to Paris is pretty much the same. It is interesting to note how soon fashion trends travel the globe. Local tastes and preferences matter little. 4. However, there definitely ARE some local preferences. According to Zara, Brazilian girls prefer bright colors and Parisians use more of black. Wonder what New Yorkers tend to prefer! 5. Fashion follows trends based on neighborhoods and not countries. This is an interesting fact. It is possible that fashion trends are different 5 blocks from each other but similar to one half way around the world. Isn’t that sort of fascinating? According to Zara, the store on Fifth Avenue in Midtown New York “is more similar to the store in Ginza, Tokyo, which is an elegant area that’s also touristic,” he said. “And SoHo is closer to Shibuya, which is very trendy and young. Brooklyn now is a wildly trendy place to go, while Midtown — well, no New Yorker is actually shopping on Fifth Avenue now.” The buyers there are suburban tourists, he meant. 6. The path of a fashion trend is complex and interesting. It doesn’t mean that people all over the world are reading the same fashion magazines and therefore buying the same fashion. Instead, it is a dynamic mix between what stores like Zara sell, what their customers tell them they like and of course, global fashion trends in general seen through the eyes of celebrities and fashion magazines. 7. According to Zara, trends for kids are the same as that for adults. Isn’t that interesting!